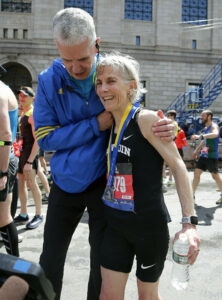 Joan Benoit Samuelson set out to finish within 40 minutes of her winning time at Boston 40 years ago, and beat that by more than 10 minutes. Shiloh Schulte of Kennebunk and Meg Brockett of Portland were the fastest Maine runners in Monday’s 123rd Boston Marathon. Schulte, 40, was first to arrive at the finish line on Boylston Street, in a time of 2 hours, 36 minutes and eight seconds. He placed 20th in his age group and 238th overall. Brockett, 23, came across a little more than 10 minutes later in 2:46:54. She was 57th among all women and 786th overall. Cape Elizabeth native Joan Benoit Samuelson, 61, celebrating the 40th anniversary of her championship 1979 debut at Boston while a senior at Bowdoin College, once again wore a Bowdoin singlet and covered the familiar 26.2 miles in 3:04:00 – well within her goal of finishing within 40 minutes of her time (2:35:15) 40 years ago.